Watching your child go off to college brings mixed emotions. On one hand, you are proud of the fact that your child has successfully completed high school and is ready to pursue higher education. On the other hand, you have to come to the realization that your baby has grown up and is moving out of the house, at least for now. Going to college is a turning point for both child and parent. Children mark their moving out as their “Independence Day” and their first step into adulthood. Parents now have to loosen the reins (it’s easier for some to do than others) and take a “hands-off” approach to their child’s life. What does not change during this time of transition is the fact that children are still dependent on their parents for financial and emotional support. As you pull things out of your daughter’s closet to begin packing, don’t let yourself get hung up on the sentimentality. It’s okay to laugh a little, even cry a little as you unearth certain mementos from her childhood. But don’t make her feel guilty for wanting to leave the nest and discover the world on her own. She might want to take her favorite teddy bear with her to college but you should hang onto that best nursing pillow for she probably doesn’t want to be reminded of her breastfeeding days. Nursing your baby was an important part of her development and a special bonding time with the little angel that no one can take away from you. Pat yourself on the back and congratulate yourself on a job well done for nurturing and shaping such a wonderful person that she has become. 1. Small Kitchen Appliances. A microwave and refrigerator are must-haves for college students. The school determines what size appliances are allowed in a dorm room. Find out what the limits are before purchasing either appliance. Also, don’t forget to bring plates and eating utensils. 2. Clothes. Take leisure clothes, such as blue jeans, tops, jackets, sweaters for everyday wear. For ceremonial occasions, pack nicer attire such as a black or blue suit, white shirts, ties, dresses, skirts and tops, dress shoes and appropriate jewelry. Don’t forget the underwear, pajamas and robes. 3. Laundry Products. Doing laundry becomes a routine in college. Purchase an ample supply of laundry detergent and fabric softener. Also, consider purchasing a laundry bag or basket in which your child can place his dirty clothes. Remember to load your child up with quarters for the washing machines and dryers. 4. Bed linens and Towels. Some colleges provide beds in their dorms while other schools require students to purchase their own beds. Regardless, the beds will need linen and your child will need wash cloths and towels. 5. Security cables or locks. Whether it’s a computer laptop or tablet or a filing cabinet, make sure your child secures her valuables with locking devices. 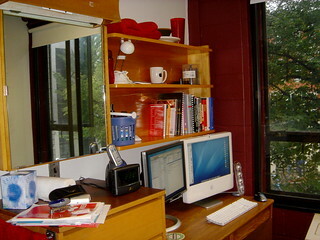 As time goes on, your child will let you know what else he or she will need for their dorm rooms. In the meantime, providing them with the essentials gives them one less thing to worry about, since their focus will soon turn to their classes. After a while, the sentimentality you first felt will fade as you adjust to your child being away from home. But before you decide to turn your child’s bedroom into a home office or install the home theater and entertainment system you’ve always wanted, remember that within a matter of weeks, your child will be back home for the holidays. Debbie Nguyen is a blogger and designer in Atlanta with a freshman in college. She is keeping and treasuring her best nursing pillow no matter what anybody else says.